Eagles running back Darren Sproles ability to make plays in space has helped the Eagles to a 2-0 record. Photo by Webster Riddick. PHILADELPHIA—For the second straight week, the Eagles fought their way back from a two-touchdown deficit thanks, in no small part, to the diminutive Darren Sproles whose speed has put opposing defenses on notice. It also helped that the Eagles (2-0) were the beneficiary of some bad calls by the officials and the strange play-calling of the Indianapolis Colts coaching staff late in the fourth quarter. by the speed of Sproles. In fact, the former Kansas State star’s play-making ability was responsible for the Eagles last three scores. Sproles crossed the end zone just once. The other two times, he put the Eagles in position to score. For the game, Sproles caught seven passes for 152 yards and had four carries for 26 yards—178 total yards.He had two receptions for over 50 yards. 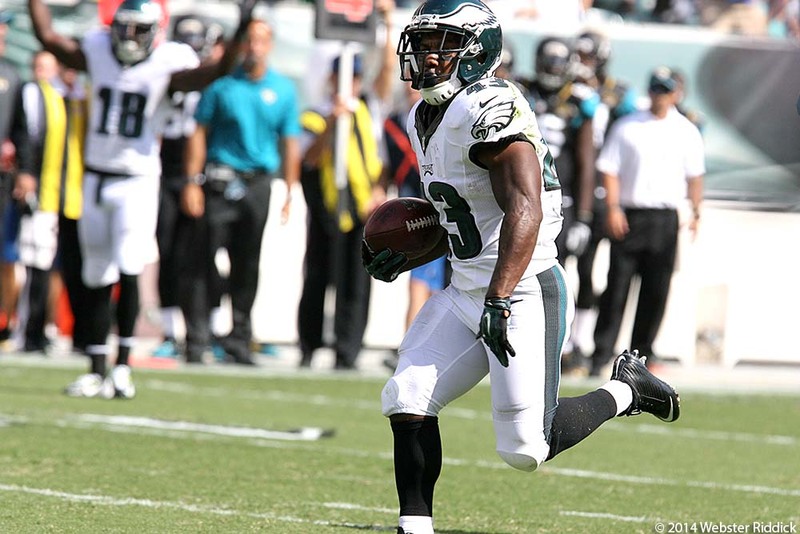 Sproles 19-yard touchdown run tied the game at 20-20 late in the third quarter. But it was his last two receptions that set up the Eagles last two scores that made the difference in the game. With 4:25 left in the game and the Birds trailing 27-20, the Eagles had a second and 10 from their own 43. Quarterback Nick Foles hit Sproles on a short screen pass. The Birds 5-foot-6 running back sped past Colts defenders and was not tackled until he reached the Colts six-yard line. On the next play, Foles hit wide receiver Jeremy Maclin for the game-tying score with 3:30 left in the game. But Sproles wasn’t done just yet. After forcing Indianapolis to a three and out, the Eagles started from their own 40 and moved down to the Colts 36 on a 24-yard pass from Foles to tight end Zach Ertz. Another swing pass from Foles to Sproles for 17 yards put the Eagles in closer field goal range for Parkey’s game-winning 36-yard field goal. A few years ago, they used to call former Eagles running back Brian Westbrook the “ultimate weapon” and Darren Sproles has become exactly that for Kelly’s offense. Within the context of this offense, he has become what De’Anthony Thomas was to Oregon’s offense when Kelly was coaching the Ducks. When the Eagles have both Sproles and LeSean McCoy on the field at the same time, it does give opposing defenses a lot to think about. McCoy gained 79 yards on 20 carries and one touchdown in the win over the Colts. He said Sproles has been an important part of the offense.